If ... you made the mistake of installing your synthetic putting green or lawn in a shady portion of your yard, you will be soon enjoying the unpleasant growth of the 3-M's: (Moss, Mold, & Mildew). This will occur if the synthetic surface was installed in an area where the 3-M's grew before. If the conditions are right, low-light, excess moisture, & poor air circulation, the 3-M's will colonize on any surface available. Rocks, Wood Decks, Patios, Roofs, & Synthetic Turfs are all prime candidates for hosting the 3-M's. This is because, the 3-M's grow on surfaces, not necessarally from surfaces. The 3-M's are capable of establishing on non-organic surfaces and creating an eyesore. TJB-INC now sells a safe & organic 3-M removal product to get rid of the eyesore and help prevent it's regrowth. This Product Works Excellent On Natural Turf As Well, With No Damage To The Turf. Works On All Turf Fungus Problems Including: Fusarium Blight, Red Thread, Dollar Spot, Snow Molds, And All The Rest! Although chemical control strategies can suppress or kill moss, they must be coupled with changes in the cultural conditions that allowed moss to encroach into the greens in the first place. The most obvious culprits on natural turf are, low nitrogen levels, aggressive mowing practices, and liberal irrigation, can usually be adjusted to some degree. Other causes of moss encroachment, poor drainage, disease problems, shade, traffic, and poor air circulation, represent greater challenges. 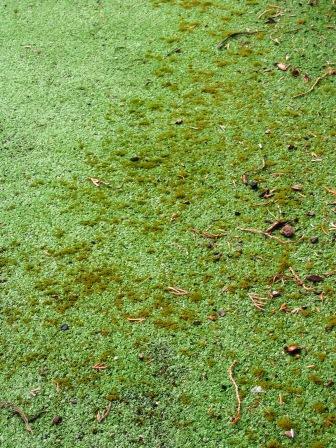 If the major causes of moss encroachment are not dealt with, even the best chemical control program will not prevent it from coming back.